I have always been a fan of technology, and while the cellphone is more than likely a 5th appendage at this point for most people, society decided we needed more technology to monitor our personal stats. And I love it. There’s more and more devices entering the market every day. They target different consumers depending on the desire of the customer, but all of them underlyingly do the same thing. They measure: steps, time elapsed on specific workouts, workout regiments in general, and sometimes even heartbeats- and they tell you if you’re “healthy”. Some of the most popular wearable tech is the Apple Watch, Fitbit,, and Samsung brands. I personally love the Apple Watch, and also the Fitbit. But I’m currently only using the Apple Watch at the moment. Depending on what kind of operating system you run on your phone, I would personally recommend different products. Since I am currently the queen of Apple, and everything syncs together, it only makes sense that I have the Apple Watch as well. If you have a Samsung galaxy , the Samsung fitness tracker would probably be the most seamless. But the Fitbit is a good tracker if you don’t really care about these things. So which products do I recommend from each brand? Fitbit: I really hate to knock the Fitbit because I actually really do like it. But it definitely doesn’t offer the most a fitness tracker can offer. Like the Samsung or the Apple Watch, those trackers can do a lot more. I’d call them full lifestyle trackers. But if you’re only looking to monitor your own fitness and kind of just focus specifically on that, the Fitbit is the way to go. And what I like about the Fitbit is that it comes in fun colors and it’s very lightweight meaning that you barely notice it on your wrist. I like this because as a woman you can stack it with bracelets opposed to having the Apple Watch or the Samsung watch and you can’t really hide it as well. I also like the Fitbit as well because it does do basic things like tell you your text messages or who is calling you. There’s also a heart rate monitor in some of the models and there is GPS in some of them as well. Not all of the Apple Watches have this feature so that’s something that differentiates the two. The Fitbit also has a very nice vibration feature that is more powerful than the “haptic” vibration The Apple Watch puts out. So you’re not gonna miss any notification of any sort. I promise! Here are some of the models of Fitbit I recommend! 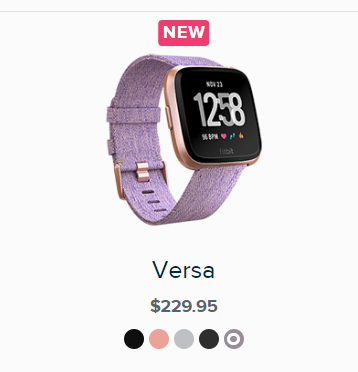 For a more watch like feel, Fitbit has the Versa. It is priced like other fitness watches. It also offers some of the same features and you can see also the colors it comes in below. The Fitbit Flex 2 is clearly the cheapest and perfect for someone just starting out who doesn’t want/need the bells and whistles. I personally like the Alta HR (I had that one), but I also like the Charge 2. The screen seems the perfect size and still stackable with bracelets to maintain fashion integrity! (I’m all about accessorizing!). Apple: I feel like Apple is constantly pushing out new products. And every time you turn around you see a new generation of the Apple Watch. But I am currently using the generation 2, meaning I am actually a generation behind. I’m planning on getting the next Apple Watch or Fitbit depending on what they look like at the time probably next year. But the Apple Watch fits me perfectly. Why you might ask? Because everything syncs directly to my phone. And while other trackers do this, it just seems so much more seamless then the Fitbit. The Apple Watch offers a lot more features than the other trackers. I personally love the step tracker and fitness applications that you can use with The Apple Watch. I’m currently using about 6 different fitness applications all of which my Apple Watch updates straight to them. On the Fitbit you’re limited to only how the Fitbit operates. While the Fitbit has a great application (in my opinion), you are limited to just that one application! On the Apple Watch just like the phone, you can pick your applications. And while I am trying to get my own fitness in order, the fitness apps on the Apple Watch sync to all of my DietBet and also StepBets. Now while the Fitbit does do this, it doesn’t do it as well. It’s just less convenient. I’d also like to add that when I do my food tracking, applications used to track my food take the data from the fitness applications and calculate it into my caloric intake, which is a lot more intense than the Fitbit can offer. And probably my overall favorite features with the Apple Watch is when it tells you to take a break and breathe. This is really helpful in the middle of the day especially at work and it reminds you that you have to take some time for yourself. And it’s just incredible that technology can remind you to do that. I also like that it tells you to stand up. And it gives you goals like 12 hours a day, you have to make time and stand up. If you do this 12 times, you reach your goal. I also like that it has achievements and you can compete against your friends who also have Apple watches. I’ll also add, the new Fitbit Versa did add the breathing feature to their new product after the Apple Watch. For the Apple Watch, I recommend the Sport model for sure. Unless you want to blow a lot of money, I don’t see the need for the ceramic, stainless steel or even Hermes version of the Apple Watch. The purpose is fitness, correct? Now which generation? I’d say it depends how much you want to spend. There’s very little difference from Generation 2 and Gen 3. I’d skip Gen 1 at this point since the processor is slower, it isn’t as water resistant and it’s going to be outdated most likely September 2018. (New model expected to release). I’d recommend Gen 2 if you’re trying to save a buck (That’s what I currently have). But if money isn’t a big deal, the GPS option in Gen 3 seems really cool. I also am a firm believer that buying refurbished Apple products is the way to go. You get the same warranty as the new ones, and they are in pristine shape. So why not save yourself some bucks? Currently, Apple Watch Gen 2 is only offered as refurbished on the Apple website. Here’s the model lineup I suggest. Keep in mind, there are different face colors and also different bands. I’ll admit it, I buy the cheaper sport bands from Amazon. I refuse to pay 50 bucks per band and they are just as good. I have the silver face with black band, pink, purple, white and sapphire blue. I love them all! They go with everything and can be dressed up or down. Samsung: This device is something I’ve always really wanted (Gear Sport). And I probably should’ve got it when I did have a Samsung Galaxy. But when I do ultimately switch to the Samsung phone after it does take the market by surprise from Apple in years to come, then I will definitely check it out. But until then I’m just going to have to go by reviews online or my friends that have them. Again this is a more advanced tracker then the Fitbit, similar to the Apple Watch. And if you’re looking to sync your statistics with other applications other than the basic fitness monitoring then this is definitely right up your alley. If you have an android operating system on your phone, this is your best bet. On the website, they also advertise you can pay using your watch, like a mobile wallet feature. I’m sure some people will really be into that feature, but again these are beyond the scope of fitness. They are full lifestyle. Here’s the Samsung lineup. As you can see they aren’t as big in terms of bands and aesthetic like the previous options. Customization is limited. But still very cool. They also seem to have Fitbit looking models as well.